Fraser golf buggies (A La Carts), e.g. the Firefly and Dragonfly originally used 4QD’s Pro-120-48. When the Pro-150 was released, we stopped making the 48v Pro-120 as the Pro-150 is just as simple and does everything and more that the Pro-120 would do. The Pro-150 is essentially the same as the Pro-120 but with bells and whistles! If you ignore the bells and whistles in the Pro-150 it is (almost) a straight replacement for the old Pro-120. The Pro-150, straight out of the box, works. Yes – it it programmable and you can re-program it. But you do not need to! We believe that Fraser used the default programming. The Pro-150 is also self-diagnosing. It tests itself and the system wiring and reports any fault found. That makes it a lot better than the Pro-120! The only problem in changing a Pro-120 to a Pro-150 in a Fraser buggy is that, if you wind the top speed adjust knob too slow, the Pro-150 will detect a fault and will bring the buggy to a stop. It will report fault Pt – the Pot resistance has gone too high. The on-board sounder will emit a continuous beep-beep-beep-beep tone. Wind the top speed adjust back a little and the fault disappears. If you can live with that – fine. It’s no problem to the controller! Otherwise a small change in the wiring is needed. 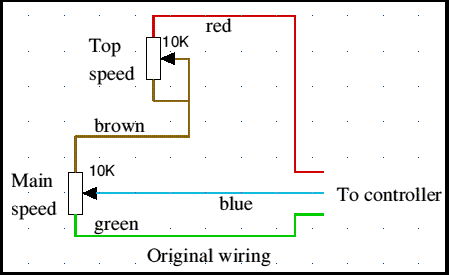 We cannot give exact details as we do not have Fraser’s wiring details, but the diagrams are as accurate as we can make them. Originally the top speed adjust was a 10K pot in series with the top of the speed pot. Both are nominally 10K (but may be 20% more or less than that). So with to speed at minimum pot resistance may be as high as 20K which is detected as a fault. 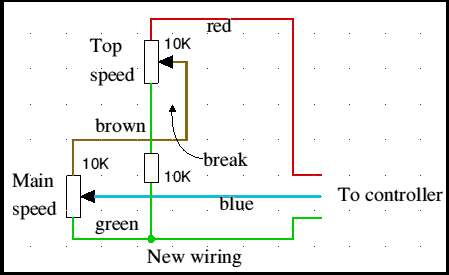 Rewired as the second diagram, port resistance is within correct limits. To speed adjust will reduce the top speed to about 30% of full speed.